The Truth and Reconciliation Commission (TRC) has a mandate to inform all Canadians about what happened in Indian Residential Schools. The Commission will document the truth of survivors, families, communities and anyone personally effected by the Indian Residential School experience. In the summer of 2011, the archives welcomed a team of researchers and scanners from the Federal Government’s Truth and Reconciliation Commission. 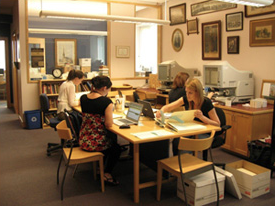 They were with us for several months reading, scanning and copying records. By the time they were complete, they had taken digital copies of over 79,000 pages held by The Presbyterian Church in Canada Archives. We also provided digital copies of all of the residential schools photographs in the collection. All of these documents and photos will at some point form a part of the digital collection of the future National Research Centre of the Truth and Reconciliation Commission. The Healing and Reconciliation Ministry of The Presbyterian Church in Canada works ecumenically, with local leaders, congregations and courts of the church to build and strengthen bridges of understanding and friendship between Aboriginal and non-Aboriginal people.